The NBA 2K League officially unveiled its first international qualifying tourney, releasing details about the Asia-Pacific Invitational tourney in Hong Kong. 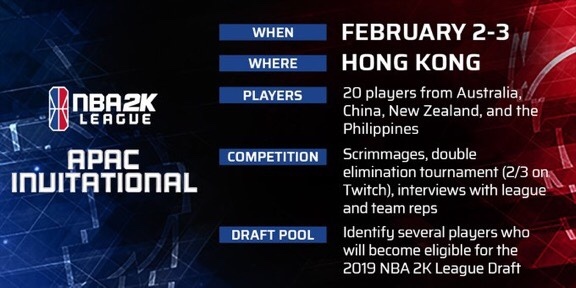 20 players from China, New Zealand, Australia and the Philippines will compete over two days in scrimmages and a tournament for a chance to earn a spot in the NBA 2K League entry draft pool. Players selected by the NBA 2K League’s on-site scouts and officials, will be added to the 198-person draft pool (pending a background and social media check). The first three game slots will likely be group play, after which teams are seeded for the double-elimination round. 1 seed vs. 4 seed; 2 seed vs. 3 seed. See the double-elimination bracket below for continuation. Game 7 is necessary if the team that has never been to the loser’s bracket loses in game six (see bracket below), in which case this becomes the championship game. The championship presentation will be followed by official player interviews. During the day, players will also have the chance to chat with league scouts and officials.